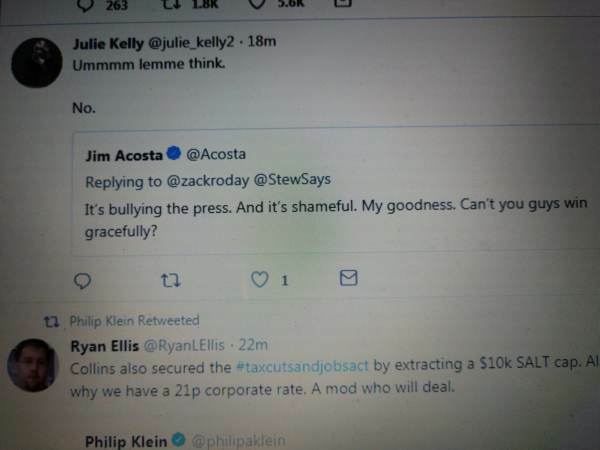 This response was when Acosta was replying to a former Mitch McConnell staffer and Paul Ryan spokesman. Oddly, @Acosta felt the need to delete this tweet just now. Can’t “you guys” win gracefully? First it was Don Stewart Acosta tangled with. Stewart, also known as “Stew,” is the Deputy Chief of Staff to Senate Majority Leader Mitch McConnell. Heads up: I think PFAW hacked your account. After that Jim did what he does best: cry. More bashing the press by those in power. First Amendment getting you down Stew? Nope, in fact I was exercising my First Amendment rights. You get to express opinions; I get to express opinions. That’s how it works. Awww Stew… I get it. Reporting you don’t like gets labeled “opinion.” Hey buddy.. I’ve been called worse. Then Zack Roday stepped in. This is what really triggered Acosta. No.. this is what bullying the press looks like. And it's shameful. My goodness. You guys had a big win today. Can't you win gracefully?